Earn 169 points to spend on future purchases. The Amara View from Philips Respironics is designed to rest lightly on the face without pinching, pressure or over-tightening. The mask's overall footprint and frame is much smaller than those of traditional full face masks. In fact, the Amara View is the smallest and lightest of all the leading full face masks on the market. When you have it on you'll barely know it's there! One benefit of the Amara View's minimalist design is a completely open field of view. There's no forehead support, no frame edge, no t-bar, no big cushion, nothing at all above your nostrils to block your field of vision. With Amara View you can wear glasses, watch TV, read, and relax in bed before going to sleep. At the heart of the Amara View is its unique under-the-nose cushion. 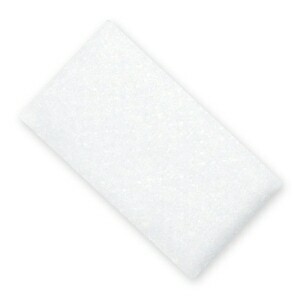 The main body of the cushion covers your mouth so you can breathe naturally, as needed, with your mouth open or closed. 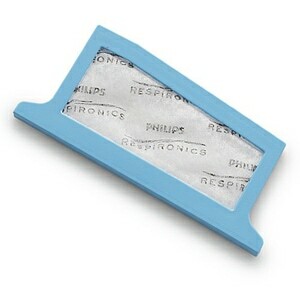 A small, rectangular hole in the top of the cushion allows you to breath through your nose as well. There are no nasal inserts, pillows or extras; just a single cushion that delivers therapy air to your nose and mouth allowing you to breathe naturally and rest fully throughout the night. A short delivery tube extends from the body of the Amara View's elbow to provide a lightweight, flexible connection to your main breathing tube. 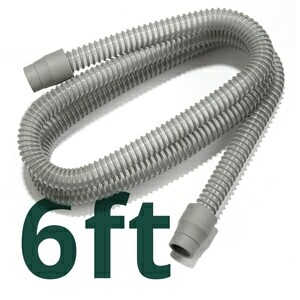 The flexible tube is designed to minimize pressure and pull on the face and therapy tubing. The 360° swivel elbow provides greater flexibility for tube positioning during sleep as well. With just four parts the Amara View is easy to clean and maintain. The cushion comes off with one click for cleaning and snaps back into place with one click when you're done -- there's no cushion clip to break, lose or replace! Amara View Headgear is soft and sturdy with inlaid tabs for convenience in gripping. Quick release Talon Headgear Clips are easy to put on and take off and they're made of soft plastic so they won't break with repeated use. Just twist the Talon Clip to remove it from the mask frame and press to snap it back on. The Amara View features a universal frame that will fit any Amara View cushion size; so if you find that you need to change the size of your mask you can simply purchase a new cushion and snap it on to your existing frame. There are three cushion sizes available -- Small, Medium & Large -- to fit a wide range of faces. In the Package Amara View Full Face CPAP & BiPAP Mask with Cushion, Short Tube, and Adjustable Headgear. Intended Use This mask is intended to provide an interface for application of CPAP or bi-level therapy to patients. The mask is for single patient use in the home or multi-patient use in the hospital/institutional environment. The mask is to be used on patients (>66lbs/30kg) for whom CPAP and bi-level therapy has been prescribed. At first I thought I would love this. Such a disappointment. It leaks like crazy and it doesn't fit my nose. Even at the loosest length of the velcro strap it presses hard on the tip of my nose. The nose cup is waaaaayyyy too small. It's a cool concept, just poorly executed. I think an extra large (not available!) would probably solve the nose problem. Keep working boys. The face piece is very hard and does not fit well. Headgear is outstanding, truly like the feel and fit. Just wish the face piece was as well thought out has the headgear. This mask presents a wide nasal opening surrounded by a small pillow. For me - a tall guy with a Roman nose - the thing leaks air loudly and continuously. The mask was great until about a month into use of this mask. The headgear stretches and needs to be replaced as it doesn't allow for a comfortable seal. The mask itself is a remedy and a relief to the full face mask by Resmed. But, after a month, I had to start using the Resmed again. Works well and unlike similar masks permits comfortable use of glasses for those of us who read at bedtime. Make certain strap goes on after glasses, not before. Could really use a simpler connector at the mask. Lighter, thinner straps would also improve the outfit. For those that have trouble with the mask, either with leaks or comfort, you've likely picked too small a size. Out of two full face mask and four pillow mask this is the only mask that I have found works for me. Slept 8 hours for the first time, no leaks, no events, id just does not get any better than this. Thank you so much! I tried this mask twice and was not happy with it on the first try but gave it more time on the second try. I am now very happy with the results. The unique shape helps with an issue I have with other full face masks which is that they tend to crown my eyes (narrow face structure I guess) and blow air in my eyes. This mask eliminates that claustrophobic feeling between the nose and eyes. I'm also getting great readings from my data card regarding event metrics and leaks. I should lop off at least one star for the ridiculous price. On a price basis I'd probably give it 1 star. But it's working well, so I'm going to continue with it. It's worth a try if you have issues with other full face masks. The mask works great and I was quite happy with it untill fall rolled around and i let my beard grow out a little longer. The mask leaks a little now when it didnt leak at all before. The amount of leak is not bad at all and it still works great. I need a chin strap, but this is the best full face hybrid I have used Very low AHI, under .5 and usually above 98% mask fit. Facial injury prevented me from wearing full face Mirage mask for several weeks. This let me sleep through the nights although it wasn't good rest - was always exhausted and irritable. No problem with headgear. Size was fine but frame just didn't fit well. Performance seemed to degrade rather quickly over a few weeks. Anyway, got back to Mirage mask and started getting much better rest. I think this might work better on a flatter/square type face bone structure. Great mask but the headband makes it unusable. What idiot designed the buckle to sit over the left side of your head. Sleep on your left side and first you get a dent. Next the buckle causes an abrasion and finally it gets infected. Left side sleepers avoid this at all costs. This mask is more comfortable than my nasal masks and because it covers my mouth also, I never have to worry about my allergies or nose congestion again. When that happens with a nasal mask you end up with a terrible night of leaks and poor therapy. I have only used this mask 2 nights but, 2 nights in a row with and AHI below 1 and absolutely no leaks whatsoever...zero, nada, nein, none! I will never go back to my nasal masks. 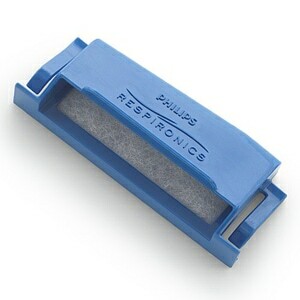 You really need to take a serious look at this innovation from Resperonics. I have been using a CPAP for many years, first with a nasal mask, then had UPPP surgery and then had to go to a full face mask. My main problem with the couple of full face masks I tried over the years was air in my eyes causing dry eyes and air leaks. The Amara View Full Face mask is great in that it covers the smallest area of the face of all so is not near my eyes. Also rarely have air leaks and easily adjusted when I do. I had pre-ordered this mask and it just came in so I have not used it a lot yet but so far, this is the mask that I have been looking for. I have tried a lot of other masks and could never seem to find one that worked but this one did. Since the top of this mask rests against your nose, that keeps the mask from sliding up my face like almost all the rest of them do. I tried the nasal pillow and hybrid masks but they left my nose sore and would not stop the hybrid masks from creeping up my face. I did find I do open my mouth at night so I needed the full face type mask but if the masks slides on you, then I would wake up with the mask resting above my bottom lips and would be all dried out. This Amara View adjusted very easily. I think I tried to make it harder than it needed to be, my thinking it had to take more adjustments but it didn't for me. The mask over my mouth stays in place and is not real wide like some of the other hybrid masks so as I lay on my side, it is not leaking air. About the only thing that I didn't know when I ordered it is they offer the standard head straps or an optional headstrap but I didn't know what that meant but the standard one works for me.